Mykel Beckley – welcome back, Becks! Khalsa are through to the third round of the Walsall Senior Cup with a 3-0 win over Bilston which was particularly notable for some returns and some firsts. 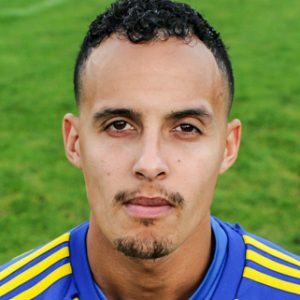 A goal for long-term injury casualty Mykel Beckley and a first goal for Khalsa for Garfield Robinson were real cause for celebration, with Lee Chilton’s 18th of the season in the second half after it took 65 minutes to break down a stubborn Bilston defence. Sitting a league below Khalsa, Bilston were game and enthusiastic opponents and but for two excellent saves by Sam Arnold after 12 and 16 minutes, both from Ashanti Pryce, the game could have taken a very different route. Khalsa began to settle after these early shocks and Dan Westwood hit the crossbar twice in the space of four minutes on 17 and 21 minutes, both times wriggling and working an opportunity to shoot from the edge of the box. Just before the break, Dave Meese ought to have put the visitors ahead, latching onto an Alex Perry pass but putting wide. Khalsa stayed patient and seized the initiative in the second half, gradually working through the gears to wear down the home side. A great ball by Carlo Franco down the right to Westwood saw him put a tempting cross into the six yard box which was converted by Beckley who was making his first start of the season. Four minutes later it was two, great work by Adam Osbourne saw him feed Chilton whose scuffed and deflected shot somehow beat the keeper, tamely bouncing in off the post. Meese should have put it out of sight on 72 minutes, somehow failing to head home from point blank range. But the third goal finally come on 82 minutes, another great Franco cross finding substitute Robinson whose magical first touch took it past the keeper and enabled him to tap into an empty net. Sporting Khalsa: Sam Arnold, Carlo Franco, Adam Osbourne, Shawn Boothe, Tes Robinson (captain), Alex Perry, Liam Armstrong, Lee Chilton, Dan Westwood (Jay Holdcroft), Mykel Beckley (Garfield Robinson), Dave Meese. Subs not used: Dale Reaney, Rico Taylor, Leon Miles.